The Arizona Mountaineering Club is pleased to offer our Outdoor Rock Climbing School. Our goal is to create a safe, fun experience that introduces you to the exciting and challenging world of outdoor climbing. Upon completion, you will be equipped with the basic skills necessary to join top-rope and multi-pitch climbs led by qualified outing leaders (as appropriate to your climbing ability). This is a comprehensive course in top-rope rock climbing. Topics include equipment selection (harness, shoes, etc. ), rope management, common climbing knots and applicability, rope types and construction, carabiner types and proper usage, climbing calls, belaying with a tube type device and Muenter hitch, rappelling, self rescue and prusiking, escaping a belay, climbing ethics, and basic climbing techniques. 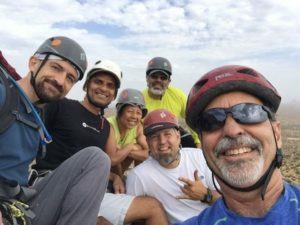 Is the AMC Outdoor Climbing school for me? People from all walks of life and a wide variety of ages enjoy rock climbing. No prior experience required! Many that take the AMC course are outdoor enthusiasts who are looking to expand their ways of enjoying the great outdoors; others have been climbing in a gym for a while and want to learn to be “real rock” climbers or have learned to climb from friends and want to “fill in the knowledge gaps”; and still others are just looking for a challenge or to overcome their fear of heights. No matter what your reason, we’ll make it a fun and rewarding experience. The AMC Schools accept anyone age 14 or older in reasonable physical condition. You don’t have to be a super-fit athlete, just capable of hiking and generally getting around in the great outdoors. Bring a positive mental attitude and you’ll be good to go. Note: students ages 14-15 must be accompanied by a responsible adult. CLASS FEE: $250 for current AMC members. If you are not already a club member, please complete the membership process by going to http://arizonamountaineeringclub.net/membership/. Please note that the membership fee is non-refundable. Dress casually; the class will be held outside, so bring clothes appropriate to the weather. Climbing shoes are needed for the weekend sessions only. The AMC rents climbing shoes, on a first-come, first-served basis on the second night of the class for $10 for the duration of the course. We will discuss what to look for in purchasing climbing shoes on the first night. Registration Info: Please follow all FOUR steps below to register for the Outdoor Rock Climbing School. Class size is limited to 40 students; register early to secure your place. Step 1: Are you a current AMC member (i.e. are your annual dues paid for this year)? If so, great; go to step 2. If not, you must go to the Membership page at http://arizonamountaineeringclub.net/membership/ and complete the AMC membership process, then proceed to Step 2. Step 2: Fill out the online form here. Even if you are already a club member, you must still fill out the online form. Step 3: Print an AMC Liability Waiver. Read the entire form, complete and sign. Bring the signed form to the first day of class. Students under 18 MUST have the AMC Liability Waiver Form signed by a parent or legal guardian. Step 4: Make payment by PayPal or check. Make check payable to AMC Outdoor Rock Climbing School, 15508 W Bell Road #101-150, Surprise, AZ 85374. If paying by PayPal, use the “Buy Now” button below. Please note that you do NOT need a PayPal account to use this service to charge your personal credit card. For questions or additional information, please contact Eric Evans by email at AMCBasicSchool@gmail.com.